Basidiomycota is one of two large phyla that, together with the Ascomycota, constitute the subkingdom Dikarya (often referred to as the "higher fungi") within the kingdom Fungi. More specifically the Basidiomycota include these groups: mushrooms, puffballs, stinkhorns, bracket fungi, other polypores, jelly fungi, boletes, chanterelles, earth stars, smuts, bunts, rusts, mirror yeasts, and the human pathogenic yeast Cryptococcus. Basidiomycota are filamentous fungi composed of hyphae (except for yeasts), and reproducing sexually via the formation of specialized club-shaped end cells called basidia that normally bear external meiospores (usually four). These specialized spores are called basidiospores. However, some Basidiomycota reproduce asexually in addition or exclusively. Basidiomycota that reproduce asexually (discussed below) can be recognized as members of this phylum by gross similarity to others, by the formation of a distinctive anatomical feature (the clamp connection - see below), cell wall components, and definitively by phylogenetic molecular analysis of DNA sequence data. Rusts (Pucciniales, previously known as Uredinales) at their greatest complexity, produce five different types of spores on two different host plants in two unrelated host families. Such rusts are heteroecious (requiring two hosts) and macrocyclic (producing all five spores types). Wheat stem rust is an example. By convention, the stages and spore states are numbered by Roman numerals. Typically, basidiospores infect host one, also known as the alternate or sexual host, the mycelium forms pycnidia, which are miniature, flask-shaped, hollow, submicroscopic bodies embedded in host tissue (such as a leaf). This stage, numbered "0", produces single-celled spores that ooze out in a sweet liquid and that act as nonmotile spermatia, and also protruding receptive hyphae. Insects and probably other vectors such as rain carry the spermatia from spermagonia to spermagonia, cross inoculating the mating types. Neither thallus is male or female. Once crossed, the dikaryons are established and a second spore stage is formed, numbered "I" and called aecia, which form dikaryotic aeciospores in dry chains in inverted cup-shaped bodies embedded in host tissue. These aeciospores then infect the second host, known as the primary or asexual host (in macrocyclic rusts). On the primary host a repeating spore stage is formed, numbered "II", the urediospores in dry pustules called uredinia. Urediospores are dikaryotic and can infect the same host that produced them. They repeatedly infect this host over the growing season. At the end of the season, a fourth spore type, the teliospore, is formed. It is thicker-walled and serves to overwinter or to survive other harsh conditions. It does not continue the infection process, rather it remains dormant for a period and then germinates to form basidia (stage "IV"), sometimes called a promycelium. In the Pucciniales, the basidia are cylindrical and become 3-septate after meiosis, with each of the 4 cells bearing one basidiospore each. The basidospores disperse and start the infection process on host 1 again. Autoecious rusts complete their life-cycles on one host instead of two, and microcyclic rusts cut out one or more stages. ^ Hibbett, D.S., et al. (2007). 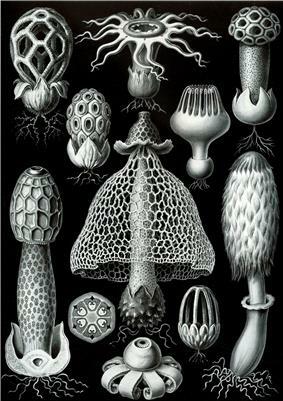 "A higher level phylogenetic classification of the Fungi". Mycological Research 111 (5): 509–47. ^ Kirk, P.M., P.F. Cannon & J.A. Stalpers 2008. Dictionary of the Fungi, 10th ed., CABI. pp. 78–79. ^ Kirk, P.M., P.F. Cannon & J.A. Stalpers 2008. Dictionary of the Fungi, 10th ed., CABI. p. 13. ^ Zajc, J; Liu, Y; Dai, W; Yang, Z; Hu, J; Gostinčar, C; Gunde-Cimerman, N (Sep 13, 2013). "Genome and transcriptome sequencing of the halophilic fungus Wallemia ichthyophaga: haloadaptations present and absent.". BMC Genomics 14: 617. ^ Padamsee, M; Kumar, TK; Riley, R; Binder, M; Boyd, A; Calvo, AM; Furukawa, K; Hesse, C; Hohmann, S; James, TY; LaButti, K; Lapidus, A; Lindquist, E; Lucas, S; Miller, K; Shantappa, S; Grigoriev, IV; Hibbett, DS; McLaughlin, DJ; Spatafora, JW; Aime, MC (Mar 2012). "The genome of the xerotolerant mold Wallemia sebi reveals adaptations to osmotic stress and suggests cryptic sexual reproduction.". Fungal genetics and biology : FG & B 49 (3): 217–26. ^ Kirk, P.M., P.F. Cannon & J.A. Stalpers 2008. Dictionary of the Fungi, 10th ed., CABI. p. 581. ^ Kirk, P.M., P.F. Cannon & J.A. Stalpers 2008. Dictionary of the Fungi, 10th ed., CABI. pp. 717–18. ^ a b Burns C, Stajich JE, Rechtsteiner A, Casselton L, Hanlon SE, Wilke SK, Savytskyy OP, Gathman AC, Lilly WW, Lieb JD, Zolan ME, Pukkila PJ (September 2010). 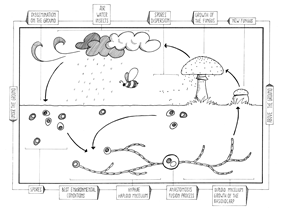 "Analysis of the Basidiomycete Coprinopsis cinerea reveals conservation of the core meiotic expression program over half a billion years of evolution". PLoS Genet. 6 (9): e1001135. ^ Lin X, Hull CM, Heitman J (April 2005). "Sexual reproduction between partners of the same mating type in Cryptococcus neoformans". Nature 434 (7036): 1017–21. Sources: (2005)et al.Adl , (2012)et al.Adl , Cavalier-Smith (2008).